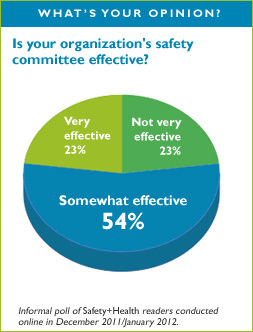 Home » What’s Your Opinion poll results: Is your organization's safety committee effective? In an informal online poll conducted in December 2011 and January 2012, readers weighed in on the effectiveness of their organizations’ safety committees. Comments from respondents who answered "Very effective"
All points related to hazards,nearmiss incidents,unsafe conditions, acts ,corrective actions of accidents safety improvement plans etc are discussed in detail and corrective and preventive actions are implemented. They are a group that has been in existenance for greater than 10 years. All members must have Medic First Aid prior to becoming a member and attend a 30 hour OSHA Class. A Culture has been created and everyone looks out for each as First Responders. We have not used a formal committee in several years. We just talk through any needed / proposed changes with management and field people and then decide the best plan based on the imput. So far it's worked really well for us. We have a dedicated group who serve as the eyes and ears of safety. We are always trying to instill safety in the minds of our employees. Comments from respondents who answered "Somewhat effective"
Not fully supported by management, meet to discuss safety issues but action takes too long or never gets implemented. It seems like you are meeting with Charlie Browns teacher, Wha wha wha wha. Just seems like the same thing is discuss at all the meeting an only somethings get done to address issues. It can be very frustrating at times. We operate with tiered committees, employee, managerial, executive committees determine next steps in safety processes, so although employees have a part in determining needs, the process can fizzle out at the 2nd and 3rd tiers. Half of the committee enjoys stopping work for little things, the other half of us spend the next week doing damage control. We are in the process of reorganizing our committee as we had a turnover in management. It started out like gang busters but as the economy has taken a downward turn so has the concerns for safety. Profit margins are smaller thus making use of time to land work a more usful part of their time management. I think our superintendents get too busy on the job to continuously watch our subcontractors, who often take shortcuts and perform less than safe acts. We have had no incidentes for two years, but this is not so for the subcontractors on our jobsites. Members aren't given much time to work on projects away from our monthly meeting, so I can't get as much work done w/their input as I'd like. Not enough time to be effective. Safety committee does not have enough training and information for safety committee training is hard to find. The members are identify safety issues that come up daily and communicate with management and other employees to resolve them. The organization has many (thousands) of committees around the world. Some are very effective some are NOT effective. We are constantly working to improve all committies. Workers from the floor recognize their safety reps and entrust them with their concerns. Those concerns are reported and discussed at meetings but follow-up can sometimes be slow. That is why I would not say they are very effective. They have little power to make significant changes. Still struggling with the culture change. A lot of lip service. Safety hasn't become a passion to very many people. That mentality comes from the top down. People do what they have to to get paid. Once it becomes important to them, it will become natural. Comments from respondents who answered "Not very effective"
Saftey items languish for months and sometimes years without effective solutions or actions. meetings to note issues, NOT be a part of the resolution. That is why starting in 2012 our site has identified this as an issue and revamped the committee! I am excited for the REVAMPED ACTIVITY based safety committee, it's about time! What's Your Opinion: What’s the most effective method for OSHA to help ensure worker safety?